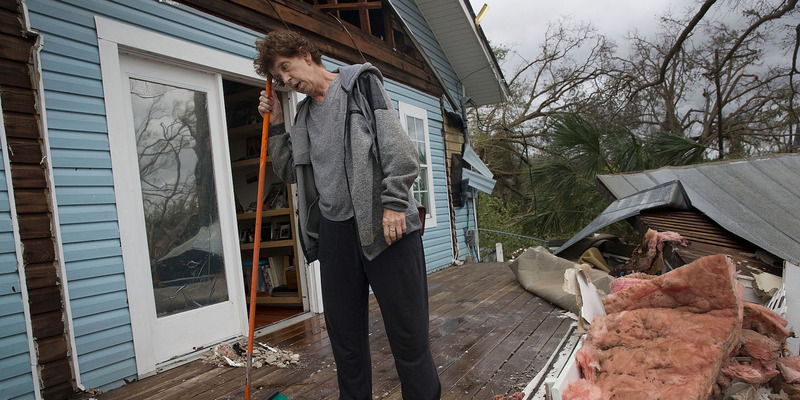 Joe Raedle/Getty ImagesPhlomena Telker on what was her covered porch after Hurricane Michael tore the roof off her home while passing through Panama City, Florida, on Wednesday. 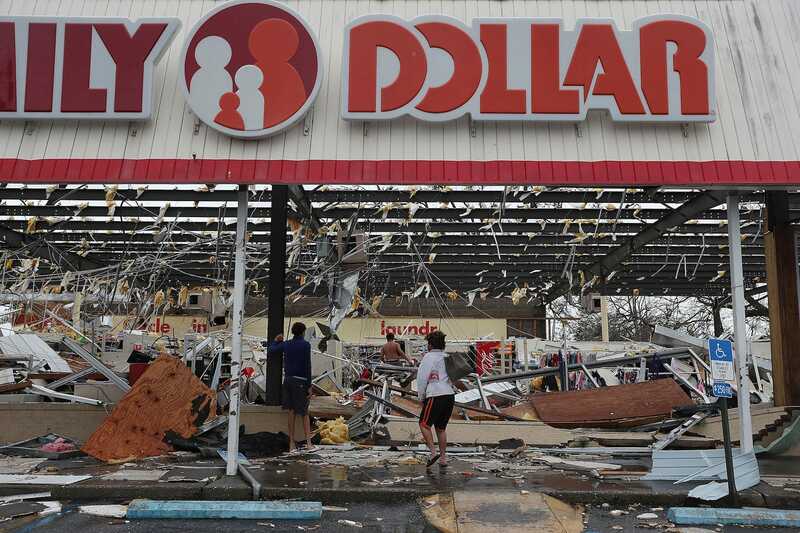 Hurricane Michael battered Florida this week as the strongest storm ever recorded in the region. 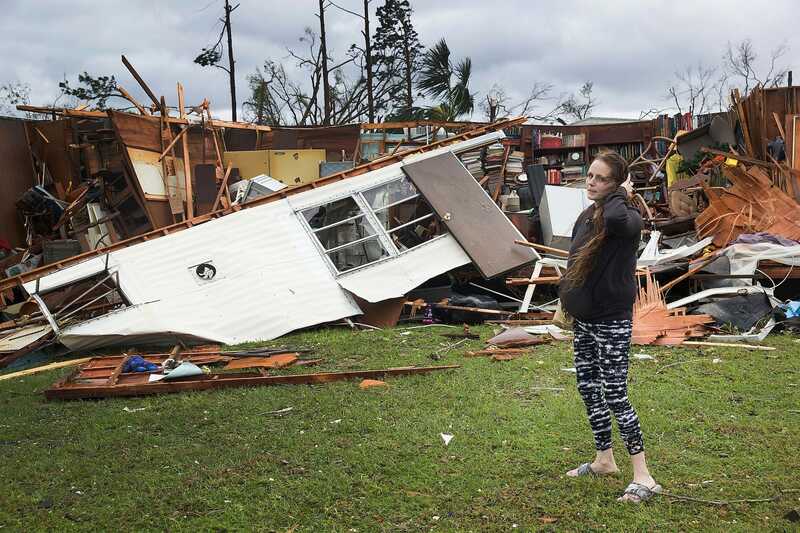 The Category 4 hurricane with 155-mph winds killed at least seven people dead and left communities with a huge cleanup operation as entire buildings were destroyed and washed away. 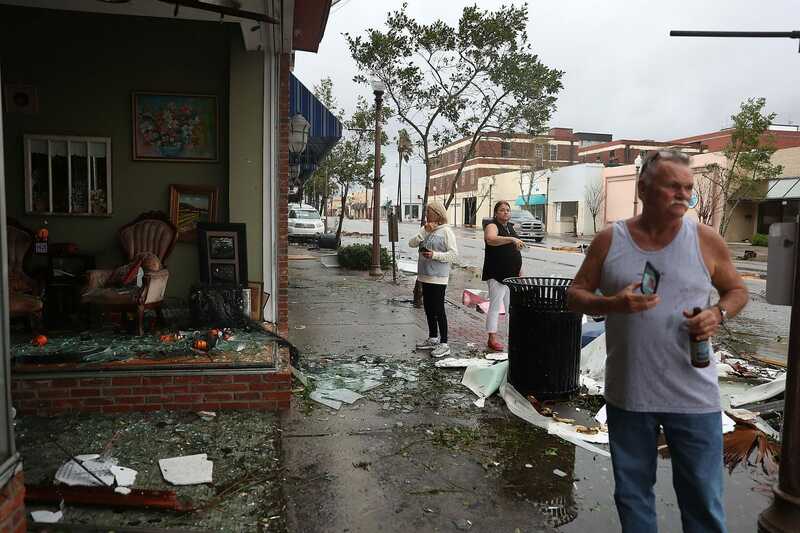 Michael was downgraded to a tropical storm early Thursday morning as it churned across central Georgia, but photos from Florida show the devastation the hurricane left behind and the work ahead for the community. A woman in front of what was left of one of her father’s trailer homes after Hurricane Michael passed over Panama City, Florida, on Wednesday. Homes and businesses have been destroyed. Here, Rick Teska, left, helped a business owner rescue his dogs from the damaged business after Hurricane Michael passed. Downed trees have prevented people from returning to their damaged homes. Michael Williams, 70, looked for help from passing motorists for food and water as trees prevent him from returning home. “I don’t know what I’m going to do,” he said. 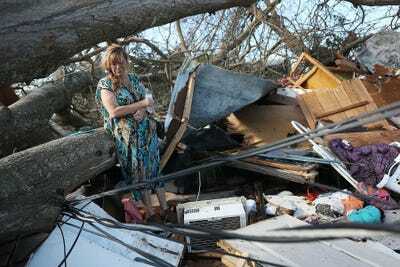 Kathy Coy stands among what is left of her home on Thursday after Hurricane Michael destroyed it. She said she was in the home when it was blown apart and is thankful to be alive. 280 people were still unaccounted for on Friday, and the American Red Cross said that 320,000 people did not evacuate despite official orders and dire warnings. The search for survivors is underway with teams, like the one pictured here in Mexico Beach, working to search through rubble. “We had houses that were on one side of the street and now they’re on the other,” Mexico Beach Mayor Bo Patterson said. 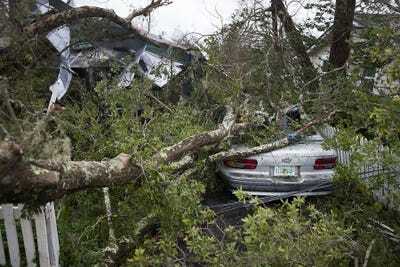 Dorian Carter looked under furniture for a missing cat after several trees fell on their home. Gov. Rick Scott urged people to stay indoors to keep the roads clear for first responders. A damaged Family Dollar store. A McDonald’s sign damaged by Hurricane Michael. Ariel photos show the extent of the damage. In Mexico Beach, where the hurricane made landfall, homes were washed away and destroyed. See more aerial photos of Hurricane Michael’s devastation here. 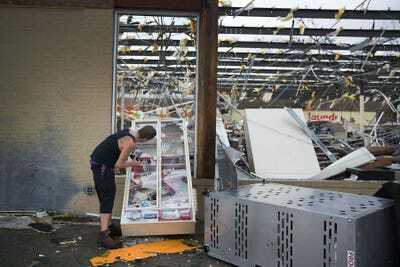 A man taking some tobacco products from a damaged store in Panama City on Wednesday. Severe flooding has hit the area. Here, a resident of St. Marks, near the coast south of Tallahassee, marched out of the floodwater near his home. More than 1,000 search-and-rescue personnel were ready to deploy to the affected areas, according to the governor’s office. “We prepare for the worst and hope for the best. 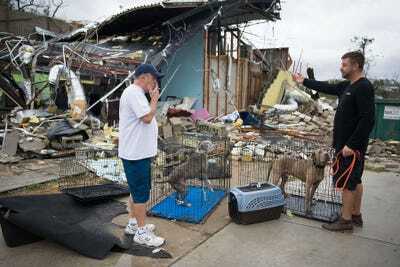 This is obviously the worst,” FEMA firefighter Stephanie Palmer said. 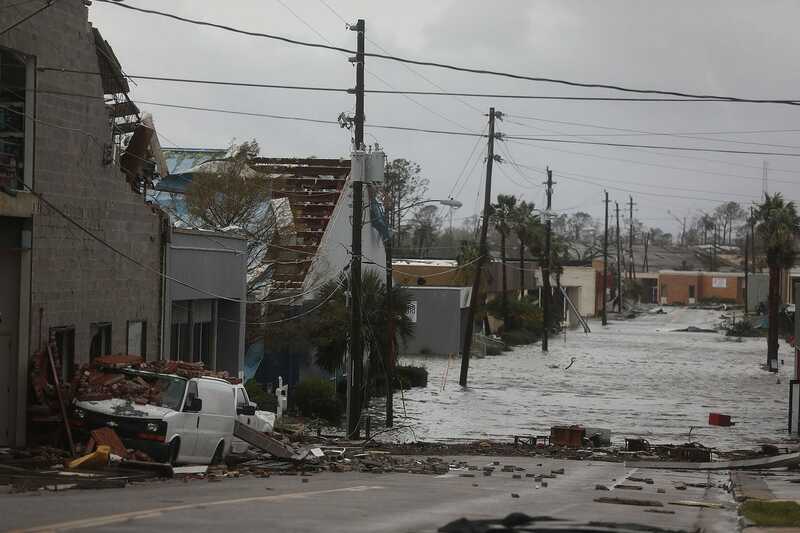 Some photos show roofs ripped off buildings, cars crushed by debris, and flooded roads, like this photo of a road in Panama City. The storm has left at least two people dead in the US, and hundreds of thousands of homes are without power. People walked past damaged stores. “We are going to be aggressive with recovery and response over the coming days and will do everything we can to assist our communities that have seen impacts from this devastating storm,”Gov. Rick Scott wrote on Twitter. Downed power lines and debris mean conditions remain dangerous. 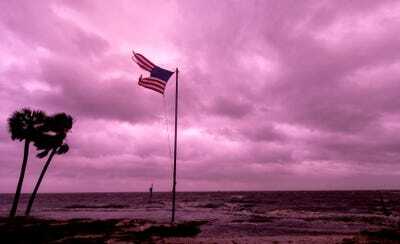 “Winds might be calming down and the rain stopping, but significant danger remains,” the National Weather Service tweeted on Wednesday night. The hurricane has produced some eerie scenes, such as this sunset at Shell Point Beach on Wednesday night.